Writing today for pan-Arab daily al-Hayat, political analyst Abdelwahhab Badrakhan says, “The United Nations might for the first time be banking on two chemical scientists to manage the planned Geneva conference on Syria instead of relying on experts in politics and diplomacy. “One, Bashar al-Assad and his regime remain in office with the consent of the opposition and the international community in order to fight the terrorists whose existence he predicted before they emerged in Syrian opposition ranks. “Two, the opposition would receive a form of words reducing Assad’s prerogatives in preparation for his exit and changing the regime’s character, making it more representative of society’s sectarian components. “The chief chemical scientists are Sergei Lavrov and John Kerry. “The former, Lavrov, is more outspoken. His laboratory does not cease blending acids with toxins, facts with assumptions and aspirations in order to come up with prescriptions that are insoluble: The priority is to fight terror and to unify the regime and opposition in the war against it. “The other, Kerry, uses his ambassador, Robert Ford, to deliver consecutive electrical shocks to tame the opposition’s demands. The opposition does not only have to live with the idea of Assad staying put, but with the army and security services remaining under Alawite command, in to prevent the army disintegrating and to protect the sect. 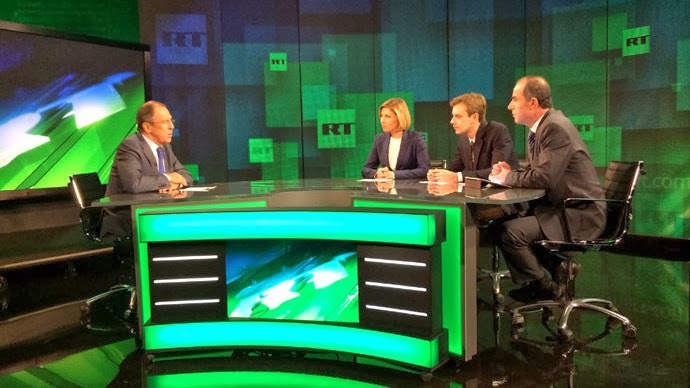 In the buildup for Christmas Day, Lavrov gave RT (Russia Today), a global news channel broadcasting from Moscow and Washington studios to over 100 countries around the globe, his appraisal of “the arrangements on Syria and Iran” and “the prospects for the Geneva-2 talks. The agreements to destroy the Syrian chemical arsenal and to convene the Geneva-2 conference, as well as the first stage agreement on further steps to resolve the Iran nuclear issue, are the fruit of years-long efforts. At least when it comes to Syria, we're talking about three years of Russia's consistent efforts of defending international law. The same applies to the progress on Iran. For over three years we'd been seeking two things: first, to get all the parties to the talks to agree that eventually Iran should have a recognized right to develop its peaceful nuclear program and enrich uranium to make fuel for nuclear power plants, while making sure that this program has no military dimension and that it is subject to total control of the IAEA, and providing security to all the countries in the region, including Israel. The decisions regarding Syria and Iran are far from being fully implemented. As for destroying Syria’s chemical stockpiles, everything is going according to plan, with minor deviations concerning the timeframe of the interim stages, though the reasons for that are objective rather than subjective. I am sure the deadline for the complete destruction of Syria’s chemical arsenal, June 30, will be met. As for Geneva-2, we still have a long way to go. We don’t know for sure that this conference will be successful. And as regards the Iranian nuclear program, we’ve only reached an agreement concerning the first phase. [Forced “democratization” results in instability]. This happened when Americans invaded Iraq; this happened recently, when NATO blatantly overstepped the UN Security Council mandate and bombed Libya; and this kind of external intervention is also happening in a number of other countries in the region. The Syrian conflict is another example of a situation where you have terrorists from all over the world, including Europe, U.S. and Russia, fight there to turn Syria, and in fact this whole region, into a caliphate. So, forced democratization by outside forces undermines stability and produces new threats. Greater stability, on the other hand, provides the best environment for democratic reforms. So, when the conference on Syria opens (and I really hope that the conference will go ahead as planned on January 22; I hope the opposition does not come up with some unacceptable conditions contrary to the Russian-American initiative), I strongly believe this conference should focus on fighting terrorism as this is the main threat to Syria and other countries in the region today. Certainly, there will be other issues on the agenda, including pressing humanitarian issues, discussions on the political process, organizing the elections, provisional institutions for the transitional period, but all this should be based on a common understanding between the government and the opposition, just the way it was captured in the Geneva communiqué produced at the first Geneva conference. So, I really hope that our Western partners and our partners in the region, which have more influence on the opposition than anybody else, will make sure, firstly, that the opposition is properly represented at this conference and, secondly, that the opposition attends the conference without any preconditions. The very point of the Russian-American initiative is that the people of Syria should agree on how to implement the principles captured in the Geneva communiqué of June 30, 2013, without any external intervention or any preconditions. But so far, unfortunately, we don’t know what the regime's opponents, who have recently formed the National Coalition, will do. We are alarmed by the fact that the National Coalition does not seem to have complete unity. We are also alarmed by the fact that the National Coalition keeps saying that this conference must result in a regime change, or even that a regime change is a prerequisite for having the conference. This is something we have never agreed to. We are also alarmed by the fact that the National Coalition does not seem to have complete control over all the groups fighting the regime on the ground. Another concern is that we see among the rebels an increasing number of jihadists who pursue extremist objectives. They want to set up a caliphate and impose sharia laws, and basically they are already terrorizing minorities. They have formed what they call an Islamic Front, and some of our partners in the West are even flirting with it – even though we know from our confidential contacts with them that they know pretty well that the organizations which formed the Islamic Front are not much different from Jabhat al-Nusra, or the Islamic State of Iraq and the Levant. This alarms us. The opposition says they will only take part in the conference if their various demands are met. Sometimes they insist on a regime change; sometimes they say they need guarantees that there will be a regime change immediately after the conference; sometimes they say they will only take part in the Geneva conference after the humanitarian crisis is taken care of. But in reality the humanitarian crisis gets worse mostly because of the militants, because of the groups that many countries have officially recognized as extremist and terrorist. So, we do need to address humanitarian issues, but instead of fighting symptoms we should fight the root cause of the crisis. And the root cause of the crisis is that the terrorist threat is extremely serious in Syria today, and the government and the opposition should come to an agreement on the key parameters regarding the future of their country, like I said earlier. By the way, I should also mention that at the G8 summit in Lough Erne in June, all the leaders of the G8 countries urged both the Syrian government and the opposition in their communiqué to join their forces in fighting terrorists in order to defeat those terrorists and drive them out of Syria. This, I believe, is our top priority today. Once the situation stabilizes, once the rights of all minorities are secured, once the multi-ethnic and multi-faith nature of the Syrian state is secured, democratic institutions will follow. Stability is the number one priority today. Having gagged the Americans, the Russians eliminated the Syrian people and their dead from the political and moral equation and started to speak of Geneva-2 as a forum aimed solely at fighting terror. In the Russians’ view, the terrorists are the Syrian civilians being decimated by Assad’s barrel bombs, Scud missiles and chemical weapons. Geneva-2, in its Russian format, won’t thrash out a Syria solution. It is evident from his words, Lavrov wants Geneva-2 to be an international occasion to reproduce Assad as president of a country he had already turned into a graveyard for its inhabitants with Russian help. The Russians’ brutality and the meanness of the Americans are such that they both are mum on Assad’s use of barrel bombs to turn Aleppo neighborhoods into burial grounds for Syrian children and civilians. Those who turned a blind eye to the use of chemicals in the two Ghoutas before applauding Assad for handing over his chemicals arsenal have no qualms about turning Geneva-2 into the grave of Geneva-1. Labels: Assad, Geneva-1, Geneva-2, John Kerry, Russia, Russia Today, Sergei Lavrov, Syria, Transfer of power, U.S.